Home / Fake News / Maria Ressa / Pres. 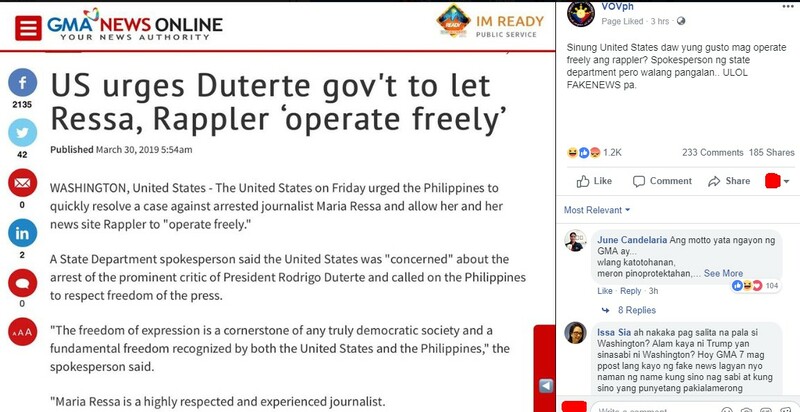 Rody Duterte / Rappler / US State Department / Viral Stories / VOVPh / Netizens Reacts on Alleged Fake News About US Urging the Duterte Govt to Let Ressa "Operate Freely"
Netizens Reacts on Alleged Fake News About US Urging the Duterte Govt to Let Ressa "Operate Freely"
Based upon the report posted by GMA News Online, the United States urged the Philippines to quickly resolve a case against arrested journalist Maria Ressa and allow her and her news site Rappler to "operate freely." The news report, however, did not name the State Department spokesperson, GMA News only released the statement "The freedom of expression is a cornerstone of any truly democratic society and fundamental freedom recognized by both the United States and the Philippines," the spokesperson said. Due to the controversial report of GMA News, netizens took to social media as they lambasted the news outlet for the alleged spreading of fake news. In a viral post shared by VOVph, they posted the following message "Sinung United States daw yung gusto mag operate freely ang rappler? Spokesperson ng state department pero walang pangalang.. ULOL FAKENEWS pa."
The statement of VOVph was echoed by some netizens who released their anger towards GMA News and lambasted the news outlet for their alleged proliferation of fake news. Issa Sia ah nakaka pag salita na pala si Washington? Alam kaya ni Trump yan sinasabi ni Washington? Hoy GMA 7 mag ppost lang kayo ng fake news lagyan nyo naman ng name kung sino nag sabi at kung sino yang punyetang pakialamerong kano!............... o baka naman si Mike lang nag sabi nyan!?? June Candelaria Ayaw patalo ang GMA sa ABS at Rapler, kailangan syempre mag fake news din sila. Felix Alterado we are a soveriegn nation,,,they cannot dictate us,,rappler operate freely,,they abused and violate our laws,,no one is above the law. Kentoy Agreda i-FACT CHECK nyo nga....mahilig kasi mag hallucinate ang mga Dilawan eh.